When you're looking to get the most from your Audi, there's nothing better than genuine OEM Audi parts, accessories, and products. That's exactly what you'll find in the parts department at our brand-new Audi dealership. 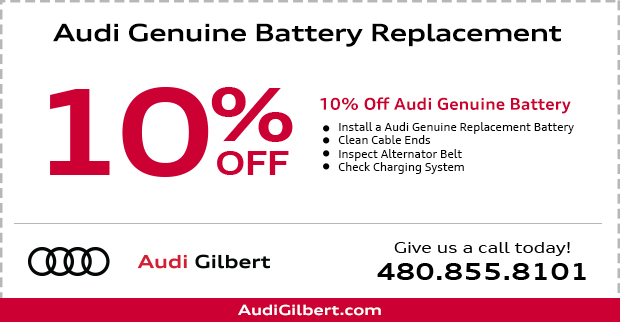 At Audi Gilbert, we're a family-owned and operated business that understands our success relies on providing every customer and vehicle with the highest level of service. 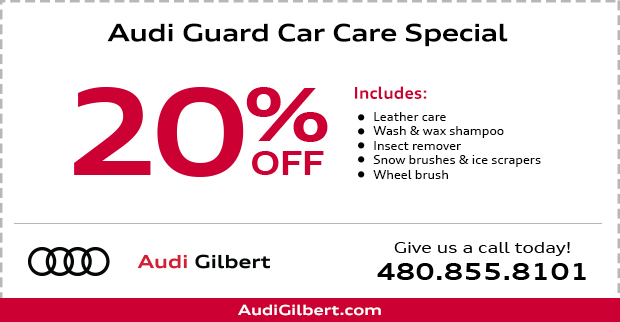 One way we want to make your experience better is with these coupons for Audi parts. These are one way we say "Thank You" to our customers who share our passion for all things Audi. 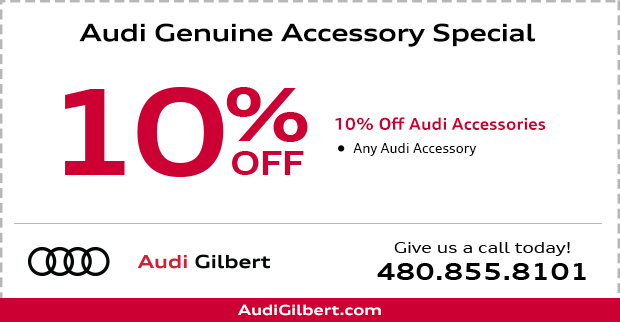 Disclaimer for all: *Valid at Audi Gilbert. Plus tax & fees if applicable. No cash value. Some exclusions may apply. Offer not valid in conjunction with any other special or offers. Must present coupon at time of write-up. Expires 6/17/2019. We also offer an Audi Boutique with an impressive range of clothing, apparel, and lifestyle items that offer the prestige and quality you expect from Audi. Whether you're looking for that perfect gift for the Audi enthusiast in your circle or you'd like to add some versatility to your ride with Audi cargo accessories, check this page first. We'll be updating these special offers frequently. 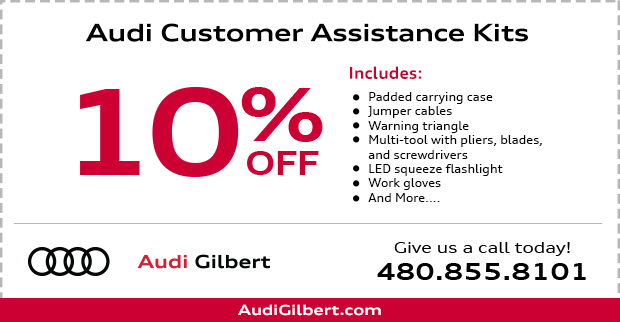 Audi Gilbert is the newest Audi dealership in the Phoenix area, and we look forward to showing you the difference that world-class customer service makes for your dealership experience. If you have any questions, please reach out to us through our online contact form or simply stop by in person at 3235 S. Gilbert Road Gilbert, AZ 85297. 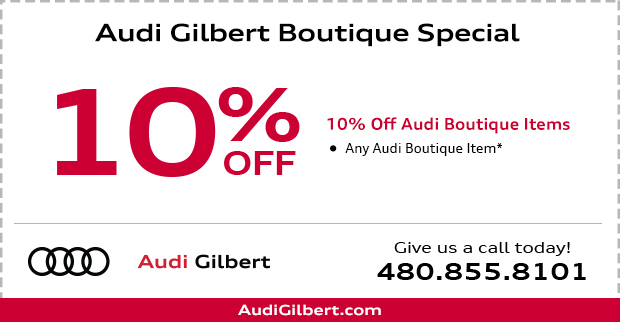 We're incredibly excited to share our passion for all things Audi with you at our brand-new dealership in Gilbert. Our inventory is full in every department, especially in our Audi parts department. Here's where you'll find everything necessary to get the most from your beloved Audi, including OEM parts, genuine accessories, and maintenance products. Of course, frequently updated special offers on parts and accessories like this one make things even more enjoyable. If it's more convenient to leave your Audi service, maintenance, and repair work to the pros, stop by our new state-of-the-art Audi service center. We've recruited some of the best factory-trained technicians to take exceptional care of your German-engineered Audi. We're a family owned and operated business, and we look forward to showing you a level of service worthy of the Audi name in Gilbert.